Tentatsu“Shiouni” is one of the Japanese top three delicacies. "Shiouni" have sweet taste and delicious sensation gradually spreads through out the mouth. 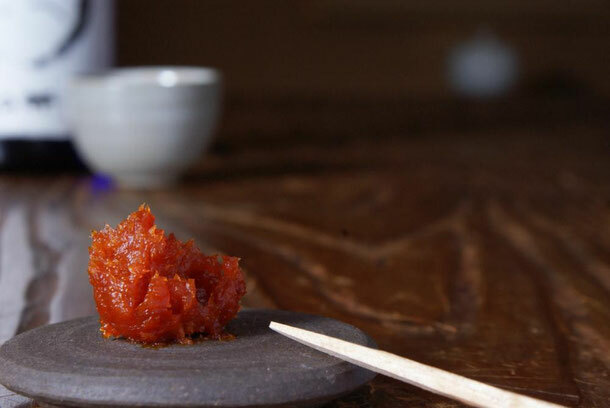 “Shiouni” is made by sprinkling salt on sea urchin, the collecting the escaping drips and condensing the taste. 100 sea urchin make 100g of “Shiouni”. You can place a small amount in Japanese Sake. Gradually the taste becomes sweet and this delicious sensation gradually spreads through out the mouth. “Shiouni” is also great on rice. Please try to eat. 200 years ago , our ancestor “Gohei Amano” discovered how to make “Shiouni”. And the “Shiouni” was given to the Feudal load of Fukui. Our company name is “Tentatsu”. “Tentatsu” was founded in the Edo period _in 1804_ , and we sold our product to the feudal lord of Fukui. At this time , our family head name was”Tenouya Tatsukiti”. The last feudal lord of Fukui “Syungaku Matsudaira” gave our family head the nick name ”Tentatsu”. After that , our shop name became “Tentatsu”.